The first of November means a nasty Halloween hangover for some; for others, it's the beginning of All Saints' Day. Stock up bunches of golden marigolds, which we've spotted at flower shops and at farmers' markets this week. Here are 10 ways to eat and drink your way through Dia de los Muertos around Los Angeles. 10. The incredible fruit and flower-laden altar de muertos at Guelaguetza alone merits a visit while it's on display through Wednesday. It would also be wise to show up hungry at the Oaxacan emporium, since the bakery will be well stocked with pan de muerto and hot chocolate fixings the next couple of days. 9. Would we expect chef John Sedlar to let a holiday such as this one, rich with centuries of history and anthropological and culinary traditions, pass him by? Definitely not. At Rivera, Sedlar and chef de cuisine Joe Panarello's holiday menu continues through November 7th. A tasting menu for the entire table is available for $80 per person with wine pairing options, along with a seasonal a la carte menu. Even if it's still 80 degrees during the day, we'll gladly try ensalada de otoño with autumn greens, cotija cheese, pine nuts and bacon-jalapeño vinaigrette; pumpkin and green chile tamale; puerco deshebrado maize cake with cranberry-habanero chutney; and pato a la naranja with red pipian sauce. Blue cornmeal cookies and dulce de leche ice cream sandwiches for dessert will reaffirm the joy of being alive. 1050 S. Flower St., Downtown; (213) 749-1460. 8. Rosa Mexicano's L.A. Live and West Hollywood locations are offering special Day of the Dead menus November 1st through 4th with pan de muerto, red chile lamb and corn pozole, candied pumpkin crème brulee with skull shaped shortbread cookies, and most temptingly from the bar, the Picosita cocktail with silver tequila, lemon, honey, muddled red bell pepper, cayenne and a charred red bell pepper garnish. 800 W. Olympic Blvd., Downtown; (213) 746-0001. 8570 W. Sunset Blvd., West Hollywood; (310) 657-4991. 7. Bar One Beer & Wine Parlour in North Hollywood adapts its weekly Lotería night on Tuesday night with $3 craft beer, $1.50 taco specials, free agave toast, skull face painting, altar decorating and prizes. 12518 Burbank Blvd., North Hollywood; (818) 509-1938. 6. This is the time to bring the creepy and crafty together. Young customers at Casa Vega in Sherman Oaks are invited on Tuesday to let their imaginations go wild while decorating calaveras de azucar. Upload images of their creations to Facebook (presumably mom or dad will handle that part) and get a free ice cream during their next meal. 13301 Ventura Blvd., Sherman Oaks; (818) 788-4868. 5. 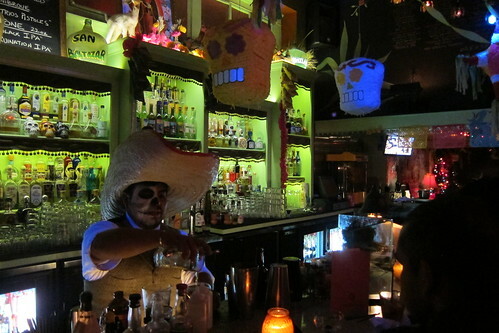 Leave it to the 213 Group to dust itself off after an action-packed Halloween weekend and steel itself for another party at Las Perlas during the second night of Day of the Dead. In case you need some help deciding what to drink from their hundreds of tequilas and mescals, go with the special Los Muertos cocktail made with Espolón tequila by Las Perlas' Raul Yrastorza. Available November 2nd. 107 E. 6th St., Downtown, (213) 988-8355. 4. A few blocks east of Las Perlas, Yxta Cocina Mexicana marks the holiday with dedicated menu items and a live DJ set from 9 p.m. to 1 a.m. on Wednesday night. Festivities include $5 margaritas, $2 tacos and new fall menu items such as roasted turkey in mole poblano, turkey tamales, rompope flan and pumpkin cheesecake. 601 S. Central Ave., Downtown; (213) 622-5540. 3. 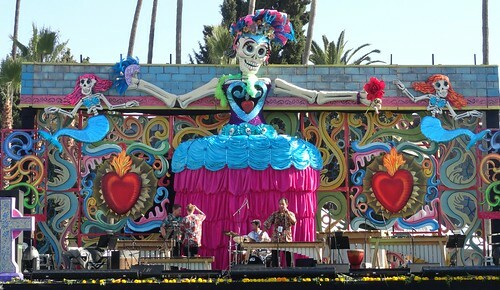 The two Malos -- Silver Lake and downtown L.A. -- get into the Day of the Dead spirit. The Silver Lake location will serve lenguas tacos with salsa verde, tacos de moronga (blood sausage) and Mandarin chicken carnitas tacos. Mas Malo in downtown will have the first two on that list plus rabbit carnitas tacos. 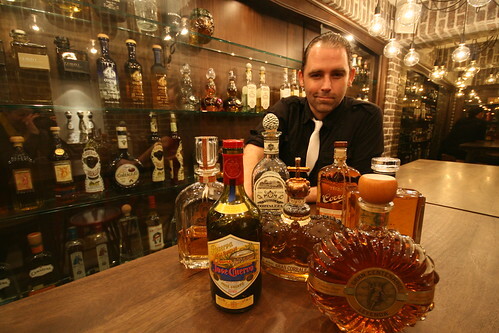 You never know what old treasures might emerge from the depths of their tequila vault. 4326 Sunset Blvd., Silver Lake; (323) 664-1011. 515 W. 7th St., Downtown; (213) 985-4332. 2. Day of the Dead in Los Angeles would not be complete without Self Help Graphics and Art's annual Dia de los Muertos procession and gathering. While it's largely a feast for the eyes, food vendors will be on hand on Wednesday from 5 to 11 p.m. during the 38th annual event. The main walking procession starts at 5 p.m. at Mariachi Plaza (where you can always pop into J&F Ice Cream Shop for a sweet treat), with a gathering also at Union Station. 1300 E. 1st St., Boyle Heights. 1. If you're already near Union Station, don't miss another major Day of the Dead festival. The Olvera Street celebration includes a Pre-Columbian Novenario procession and blessings with free pan de muerto and champurrado at 7 p.m. on Wednesday evening. Taking public transit is highly recommended, if you plan to attend either or both the Olvera Street and Self Help events. 845 N. Alameda St., Downtown.